"Will a FitBit Fitness Tracker Make Me GAIN Weight?" She had also read this article: http://www.today.com/health/fitness-band-frustration-users-complain-weight-gain-trackers-t66146 which says, "some wearers are experiencing fitness band frustration. They find that their Fitbit actually moves the scale in the wrong direction — making them pack on the pounds, as opposed to maintaining or shedding unwanted weight." Food Journaling for Weight Loss: What Would Nancy Drew Do? Some people think food journaling can be a 'drag', but it can be a GREAT tool for awareness, accountability, and problem-solving! Think of it as your own “Sherlock Holmes/Nancy Drew” strategy, or detective tool! Once we see what we are actually eating, and what challenges we are facing in our daily lives, it becomes much easier to take charge and create simple solutions. We use this tool in our clinic every day, and we are now offering online and phone/Skype counseling and journal analysis for convenience for people who would like help from a distance. Research including the National Weight Control Registry shows that those who use a journal are far more likely to be successful both in losing weight, and keeping it off for the long term. How does a journal work? It’s one thing to know what to do - and another to thing to make it happen! Journaling helps us see what challenges might be “tripping us up” - and analysis helps us come up with simple solutions for problems. Journaling can be done with a free smartphone app such as “MyFitnessPal” (with a little tweaking of the app - we show people how to set to protein goals properly, for example), or even on paper (“old school” pen-and-paper notebooks are still popular, and they work too!) Research has shown that those who use smartphone apps tend to be the most successful, since they are simple to use once they are set up, they have a vast library of calorie, protein and other nutrient information at your fingertips, and they allow in-depth analysis, and instant problem-solving. But good news for those who like old-fashioned pen-and-paper - handwritten journals come in a close second place for success. Choose whichever feels most comfortable and natural for you, and you are most likely to actually use it! What should we record in a journal? Food (what we ate and when) and calories, to start. It is useful to also include exercise, other daily physical activity (chores, etc), sleep (quality and quantity), and stresses or other challenges in life that might be making it tough to stay on track with our healthy lifestyle. Most smartphone apps will instantly enter calories for you (and will automatically calculate other information for you, such as protein, fiber, carbohydrate, sodium, and macronutrient balance - all very helpful information), and have a way to record your exercise. They also have a note section where you can record your sleep, challenge or stress you faced, and ideas and thoughts on your journey. If you choose to use a written journal, it may be easiet to record just food (type, amount, calories, and time), but it might be too much to try to record protein, carbs or other nutrients (unless you like to write a lot!) Our nutritionists can review a written record and quickly calculate the protein amount (they are really good at their jobs!) Also jot down activity, exercise, sleep, and stress/challenges you faced, and other thoughts you might have about your health journey, and we’ll give you insight, feedback, and ideas to make your healthy lifestyle more simple, tasty, and fun! Sometimes we realize, after looking at our journal, that we are doing really well 90% of the day, but have a “trouble spot” that keeps tripping us up, day after day, despite our best intentions. Intentions are good - but a concrete, realistic plan is even better! For example, if you start out with a great breakfast and lunch, but then overeat in the afternoon or evening, a quick review of a journal can help identify what the problem might be (it might be a breakfast too low in protein, a lunch too high in carbohydrate, or a lack of a high-protein snack in the early afternoon, for example). Another example: we THINK we are eating the right amount of calories for our needs, but are gaining weight (or not losing the weight we want). A journal analysis can identify hidden calories (and we can provide tasty alternatives for food that is too calorie-dense, for example). Or perhaps a journal analysis may reveal an imbalance in our protein-to-carbohydrate ratio (known as “macronutrient ratio”); we can easily rebalance your meals and snacks. These are simple problems to solve, if we analyze them, and create a solution. What does the research say about journaling ? Do we really need to journal, or can we just learn about nutrition, and try to stay motivated on our own? Studies have found that an individual’s motivation to lose weight combined with nutrition knowledge are NOT enough to maintain healthy weight long-term. Weight loss is very difficult and regain is very common; the most powerful predictor of long term weight loss was the amount of journaling done each week! Journaling enhances accountability and awareness of current behavior - it keeps us on top of our game. Journaling also helps us preplan our meals and exercise, set small attainable goals, and overcome resistance and challenges we face when trying to establish and maintain healthy behaviors. 2,3. One study evaluating self-monitoring behaviors related to weight loss found those who journal the most over a 6 months period lost significantly more weight than those that journal the least. Individuals counting calories and/or measuring food most days of the week also experienced greater weight loss. Another key finding: the amount of journaling done in the first 18 weeks of a program was directly associated with amount of weight lost. It makes sense that getting off on the right foot - and solving problems early and assertively - leads to better success. New habits are tough to set up, and establish, and can take time to “solidify” so they become “second nature”. Journaling and analysis can help this process. Our Nancy Drew team can help! Healthy Frozen Dinners for Busy People! Do you need quick, healthy dinners to fit your busy life? No time to cook? When life is crazy, you need to simplify wherever you can, stock up, and be prepared. It can seem daunting, but healthy frozen meals do exist, if you know where to look. We've compiled a list of tasty meals containing fewer than 400 calories, with good quality protein, balanced with a proper amount of carbohydrate, without excess sodium. Our meal goals: fewer than 400 calories, at least 10-15g of protein, balanced protein:carb ratio (ideally 1:1, no higher than 1:2), less than 40g of carbohydrate, less than 10g of saturated fat, and ideally less than 600mg sodium. These meals can make dinner just a little bit easier, when life gets really busy! If you'd like to simplify further, you can try our "Fast Track" to make your life even easier (and healthier): http://www.seacoastnutrition.com/phase-one-2-week-quot-fast-trackquot-pla2.html We love to help people set up sustainable, realistic nutrition, exercise, and lifestyle plans - we're here to help! 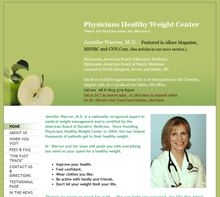 Learn more at healthyweightcenter.com, or call (603) 379-6500, any time!